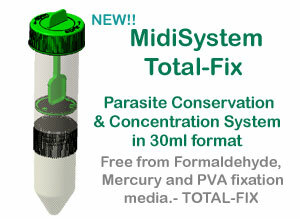 REAL launches its new MidiSystem for conservation and concentration of stool samples for parasite diagnostic. This new 30ml device, allows the analysis of a bigger quantity of sample. Together with REAL MiniSystem, the new MidiSystem will be supplied with a wide variety of fixation media (SAF, ECOSAF, MIF, TOTAL-FIX).